I collected these as larvae in Early April. Discovered just today they had pupated. 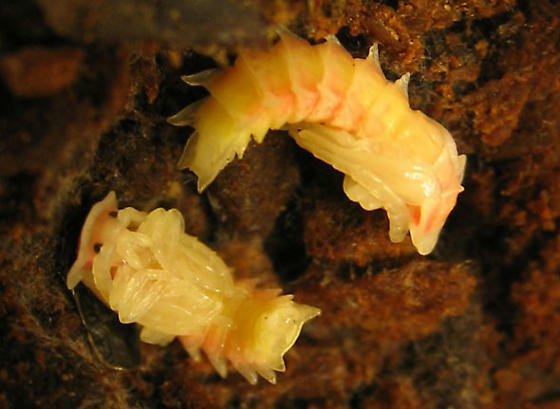 The Guide now has a number of photos of beetle larvae with toothed edges (placed under Coleoptera, Lampyridae, and Lycidae); I hope these pupae make it to adulthood - it would be great to have shots of the same individuals at all three stages. What did these ones look like as larvae? While I did not photograph these two pupae as larvae, I have photographed ones that, in color and form (I don't know about size), appear identical to me. I'll post photos here. btw, I brought back a large Prionus-type cerambycid larva from California in March, successfuly fed it puppy chow, and have normal larva, prepupal larva, and two pupal stages photographed, hopefully to be complemented by an adult shot or two. I'll post them as a set after emergence. Quite the change from the larva, but it's only part way done. to think of how this form of maturation evolved. Jim, it would be great if you could do an article for the Articles section (under the forums tab) on rearing beetles. I would like to try my hand at it but would want to learn more from someone who has done it many times as you have. You're getting some great life history series. OK, some day I will. Meantime, for anyone who finds a beetle pupa, just treat it gently and place it in a sealed jar or tupperware container with something moist such as rotten wood duff or a moistened scrap of paper towel. The oxygen needs of pupae (grubs too) are very low, so don't ventilate container. It's better to keep it contantly moist but not wet than to allow air exchange. I saw an article with pix online describing how longhorn beetles were reared in great numbers for pesticide testing. As soon as the grub pupated, they popped it into a test tube and sealed it with a rubber stopper till it emerged. So your pupa will do just fine in a sealed jar. Keep container out of sun and check daily for emergence. I currently have 10 or so small pupae from various families resting together in one container, and one large longhorn (probably prionid) in a seperate container. The nice thing about raising pupae is that you don't have to feed them, and odds are good that a beetle will emerge. Thanks, Jim. That's enough to get me started when I find some interesting pupae. When you do the article, please include larvae. I am sure they will be trickier because you have to add such factors as feeding them and keeping them from killing each other!